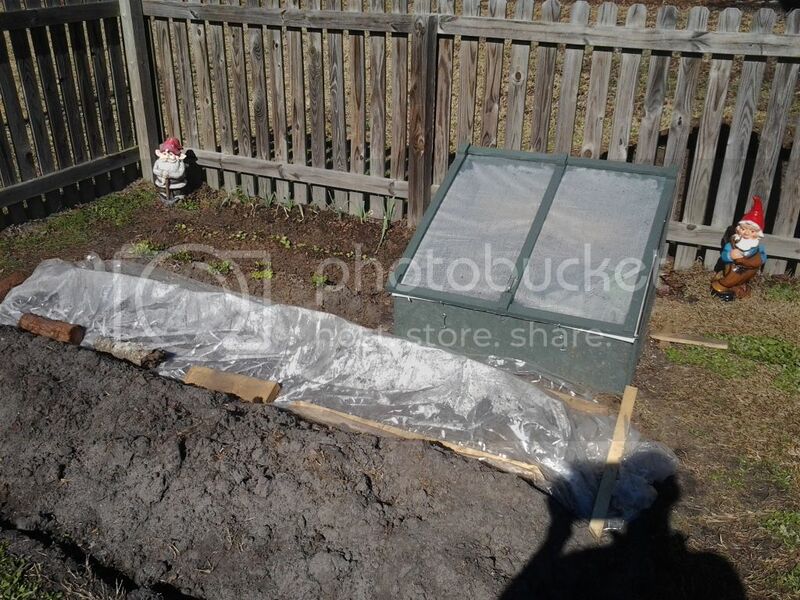 I'm not a newbie to gardening or seed starting, but with major garden expansion plans this year, a "cold frame" is looking like its going to be a necessity, and that I am totally new to. My issue is I will be starting a lot more plants this year, particularly peppers and tomatoes, and I'm positive I'm not going to have enough area with my grow light setup to keep all my plants there until they are ready to go in the ground. So correct me if I'm wrong, but this tells me my best solution is either to purchase more light setups, or build a greenhouse/coldframe. I know that the two are different, but sort of have the same idea. This is where my questions and concerns come in. I may have jumped the gun a little, but I already took some salt treated lumber laying around and built my frame. It is basically a wedge, but with a slightly raised front. So the front, or what will be the southern most side is 6" tall. The back wall or northernmost side, is 42" tall. The width, or east/west measurement is 4', and the depth, or north/south measurement is 3'. Not sure if i've confused everyone already, hopefully not. -The back wall that is 42" tall will be plywood that is nailed and glued to ensure it is sealed as best as possible. I will paint the inside of this wall white to help reflect the light onto the plants. So far so good? -The same with the side walls or wedge shaped pieces. Plywood nailed and glued. Inside painted white. Still good? -Now the top is where I start to have questions. Before i started this i looked around for cheap or free windows and found nothing. I have a bunch of clear plastic around. And I am more than willing to go purchase plexiglass, or polycarbonate, or whatever I need. What is the best material to use here as far as material, thickness etc? And while I'm here, does anyone know the approximate cost of the material I will need? Anyway, other than one brace in the center, I will make this whole south facing roof/side out of this clear material. Obviously, it will be a little tough to build it to have a really good seal, yet still make it accessible daily for watering/maintenance etc. Anyone have pics/ideas on how to actually construct this part to maximize my efficiency? -My other questions have to do with scheduling, temps and such. First, what kind of daytime/nighttime temps do I need to ensure I can keep my plants in this thing and ensure they don't die? I'm thinking I will have to move my first batch of plants to this thing when they are about a month old...is this too soon as far as plant size? -I'm sure i've overwhelmed you guys with questions, so my last question for now is about using an actual heater in this thing. I have several small ceramic electric heaters at my disposal. Would it be a good or bad thing if I set on up inside my coldframe on a timer? I'm thinking maybe set it to turn on at say 10pm for 30 min, and 2a.m. for 30 min to try to ensure I keep heat in it. Is this at all necessary? I'm sorry for asking all of this guys. I really am. Any help that anyone can offer is greatly appreciated! Thank You. quite a range of questions - I'll toss in a few pennies and see if it helps. typically they are used as a jump start for early, or a season extender for late. temps in a cold frame will fluctuate wildly - in fact the usual problem is too much heat - resulting in 'cooked' plants. if you are not 'home' all day, everyday to tend to 'venting' a cold frame, a thermally operated vent gadget can greatly assist in avoiding that problem. the small interior volume results in very fast and potentially extreme swings of heating / cooling. as to setting out seedlings into a cold frame - the seedlings need to be hardened off - going from a constant cozy environment to a cold frame can easily stunt them. especially for tender stuff like peppers. your basic design is fine. covering can be sheet plastic or rigid plastic. glass is "ideal" for light / heat transmission but it is more fragile and also entails the possibility of breaking with not nice results in terms of total environmental loss and/or personal injury. tempered safety glass would be nice - but that's an expensive and custom order option. making the most out of a cold frame is not rocket science - but it is also not a "It's Feb 23, so I can set the pepper seedlings in the cold frame" kind of "blindly by the calendar" thing. as to providing supplemental heat, I would strongly advise against the 'timer' routines - get an "in line thermostat" control. that senses the interior temps and turns the heat on when needed. the timer approach cannot compensate for "today it's bright & sunny" vs "today it's cloudy and cool." bottom line - cold frames are good - some experience required for optimum success. Thanks for the replies thus far, much appreciated. The most surprising things I see is the minimum night time temps. When i look at the averages for my area those night time low temp averages aren't reached until may. Last year I had peppers and tomatoes in the ground May 10th. I like your idea of the inline thermostat. Didn't get much info on a google and an ebay search. Could you lead me in the right direction? Maybe my plan isn't what I should actually be doing. My plan was to move the plants into this thing toward the end of march to make room for the new starts. But low temps in the 30's aren't out of the ordinary at this time. Maybe I need to rethink my strategy and invest in more lights? I still would like to see an example of this inline thermostat you speak of. It certainly seems like a great idea, and possibly exactly what I need to get my plants moved, when i need them moved. >>When i look at the averages for my area those night time low temp averages aren't reached until may. I'm not talk about "open garden" night temps; it refers to the temp _inside_ the cold frame - there's a big difference elsewise cold frame would not have a lot of purpose, eh? "in line" thermostats are temperature controlled switches where the heating 'device' is plugged directly into the 'control' circuit. the alternatives are stuff like control sensor which cause "relays" to engage/disengage to power the heating devices. because they are "in line" they have limitations regarding how much electrical power they can switch on / off. other not in line devices can switch giga-/mega-watt circuits on and off - not a quick&convenient as the in-line stuff. Dilbert, thanks so much for the clarification on the temps. That makes a lot more sense to me! I was thinking, "50 degree night time temps...hell why does anyone even use a cold frame!" lol. It's actually Milton, Delaware that I live in....close to the beaches that are a hot spot for PA tourists lol. I think i'll go ahead and finish my build, and maybe try some different things to ensure my temps will be ok. I actually have two heaters that have thermostats with a "low/medium/high" setting. I keep one in my grow light room in the basement. The heater turns on and off by itself on the high setting, and i'd say it keeps the room at about 80 degrees. So I think I'm gonna put a thermometer in my cold frame and plug the heater in on low, and go out on a cold night and see what the heater does. Since it turns on and off by itself, it may work great. I just have to make sure it keeps the temp where I need it. Thanks again, and i'll be sure to keep everyone updated on the project. Although I'm the "garden foreman", I have two younger brothers ages 11 and 14 that are gonna do a veggie stand, thus my reason for massive upscale of the garden this year. A low wattage light bulb painted black can keep your cold frame warm at night. Cool...thanks for the idea storms. I think what I need to do is get the box built and then experiment with a couple ideas to ensure i can keep my temperature right. oh! used to fish off Slaughter / Lewis Beach... coupla' centuries ago. neglected to put in: for rigid plastics, acrylic or polycarbonate are the most transparent. bit pricier, but for the relatively small qty should not be a killer. you may need to go to a glass repair place to source it. hairdryers are my choice of cheap/available heaters - you get heat and air circulation all in one go (g) if you've already got something, certainly a consideration. yep...10 min from Lewes max...a hair longer to slaughter. I spend a many of hour fishing in lewes every year, but that will likely take a hit due to the garden expansion.